It really had been quite some time since i last cook a complete meal. Today, i woke up pretty early, do some house work and went to the supermarket with the mind set on buying ingredients for making some stuff for my weekly family gathering at my brother's place tommorow. As i was window shopping around in the supermarket, decided maybe i could cook some stuff for lunch as i'm really tired of eating out every day already. Lolz. 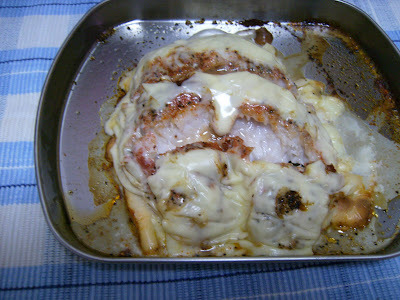 So for today's lunch, we have baked white snapper. 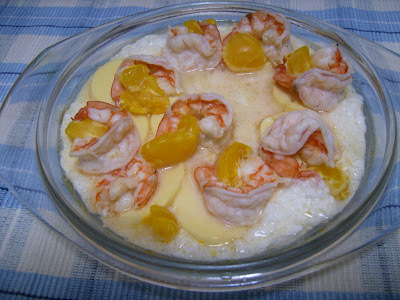 This is actually a modification of baked cheesy prawn which i recommended earlier. I do some adjustment to the recipe and come out with my recipe of baked white snapper which is available in my bon appetite blog. Doesn't this look cheesy? But actually it is not, it is infact very juicy. 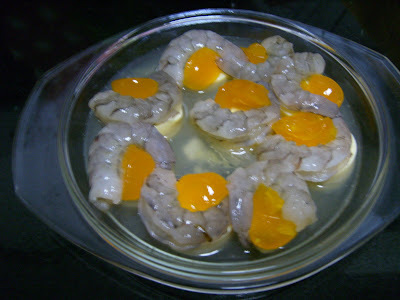 Another dish which i make is Steam Salted Egg Toufu Prawn. This is my creation from my memory some 20 years back whereby i tasted something like that. I also make a chinese cabbage with fish dumplings soup. Didn't take any picture because i think there nothing to show off about this soup. I loves to use chinese cabbage in soup because it always make the soup very sweet and tasty after 20 minutes to half an hour boiling. No salt is needed if u just drop a chicken bullion cube to the water, the cabbage and the fish dumplings will contribute to the rest of the flavour in the soup. This is a quicky to complete the meal with vegetables. Oh yes, btw, i just bought a 3 in 1 scanner/printer/copier and a new 10.1 mega pix digital camera from the recent IT show. One more purpose of cooking today's meal is also to test out my new camera. How do you all think about my new camera as compare to the old one? It had better looked better, * wink wink *otherwise, you may all conclude that i'm a lousy camera man. But hey, i'm at least contributing to the economy's recovery by SHOPPING.